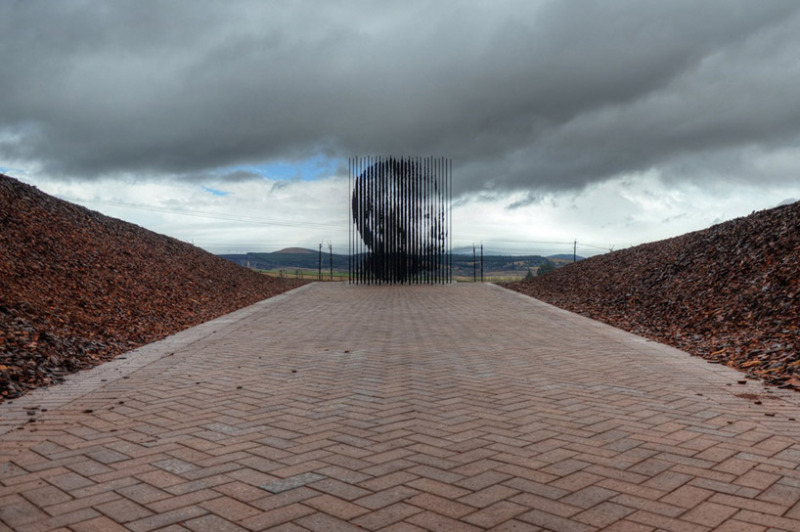 A very cool monument by Marco Cianfanelli to recognize the 50 year anniversary of peace activist and politician nelson mandela's capture by the apartheid police in 1962. Made up of 50 steel columns, together they form a portrait of the great mans face. Marco says, "this represents the momentum gained in the struggle through the symbolic of mandela’s capture. the 50 columns represent the 50 years since his capture, but they also suggest the idea of many making the whole; of solidarity. it points to an irony as the political act of mandela’s incarceration cemented his status as an icon of struggle, which helped ferment the groundswell of resistance, solidarity and uprising, bringing about political change and democracy."